(Verso) inscribed "Collection C Jusky(?) peintre" in brown ink. Music formed a recurring theme in the work of Jacques-André Portail. 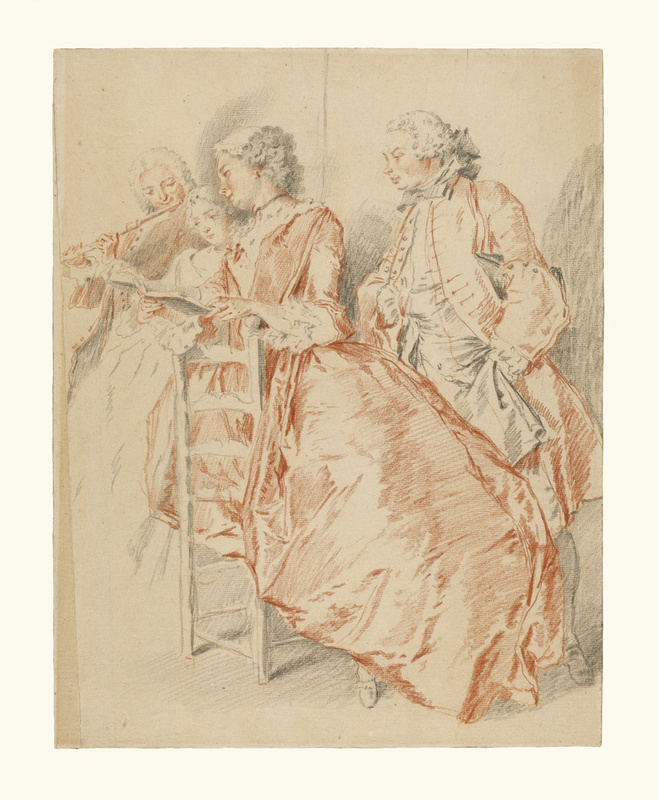 In this drawing, two young women lean together over a book of music to sing a song, accompanied by a flutist. A single man stands behind the trio, leaning forward with his hands stuck in his vest and pocket to observe the music. Though he skillfully represented the figures' elegant costumes, Portail focused more on the scene's quiet absorption, as all four appear to be totally engrossed in their activity. He built up the scene with numerous, dense lines of different intensities and simply left the highlighted areas blank, allowing the whiteness of the paper to form the tonal contrast.